Under the Rashtriya Madhyamik Shiksha Abhiyan (RMSA), 1338 new Government secondary schools with a total outlay of Rs.837.78 crore have been approved till date in respect of Minority Concentrated Districts (MCDs). As per the Unified District Information System for Education (U-DISE) for the year 2014-15, out of 1338 secondary schools approved in MCDs, 960 secondary schools are functional. The Sarva Shiksha Abhiyan(SSA) provides for opening of new schools, construction of school buildings, construction of additional classrooms, additional teachers, Kasturaba Ghandhi Balika Vidyalayas (KGBV), provides free textbooks to all children from classes I-VIII, provides Urdu textbooks for Urdu medium schools and where Urdu is taught as a subject, free uniforms (two sets) to all girls and children belonging to SC/ST/BPL. Priority is given to infrastructure for new schools, toilets and buildings in areas with concentration of minority population. KGBVs have been opened in Educationally Backward Blocks (EBBs) where the female rural literacy is below the national average to provide for residential upper primary schools for girls. The KGBV reaches out to (i) girls who are unable to go to regular schools, (ii) out-of-school girls in the ten-plus age group who are unable to complete primary school, (iii) younger girls of migratory population in difficult areas of scattered habitations that do not qualify for primary/upper primary schools. Among these girls KGBVs provide reservation for 75% girls belonging to Scheduled Caste (SC), Scheduled Tribes (ST), Other Backward Classes (OBC) and minority communities. 25% priority is given to girls from Below Poverty Line (BPL) families. A total of 555 KGBVs have been sanctioned for MCDs upto 31.3.2015. Under the Scheme for Infrastructure Development in Minority Institutions (IDMI), an amount of Rs.11.45 crore has been released covering 126 minority institutions during the year 2014-2015. The 19th Conference of the Commonwealth Education Ministers was held at Nassau, the Bahamas from June 22 to 26, 2015. The Conference which deliberated upon Quality Education for Equitable Development was attended by the education ministers of 38 Commonwealth countries. The Union Minister for Human Resources Development Smt. Smriti Irani led the Indian delegation which comprised Chairman UGC, Chairman NIOS and JS School Education and Literacy, MHRD. The Conference was inaugurated by the Prime Minister of the Bahamas Mr. Perry Gladstone Christie. The plenary sessions were chaired by the Minister of Education, Science and Technology, the Bahamas Mr. Jerome K. Fitzgerald. While responding to the issue paper on Quality Education for Equitable Development: Performance, Paths, Productivity the Union Minister Smt. Smriti Irani said that there could be no more opportune time than now that the Commonwealth countries work towards a more coordinated and holistic approach towards rationalizing methods and processes for inclusive and qualitative expansion of education in the respective countries. She underlined the significance of creating common platforms for deliberations on issues of mutual concerns so that issues like expansion, equity and excellence could be addressed in an integrated perspective. She also observed that a key measure of inclusive education would require significant increase in skill development initiatives to meet the emerging human resource requirements. The Union Human Resource Development Minister Smt. 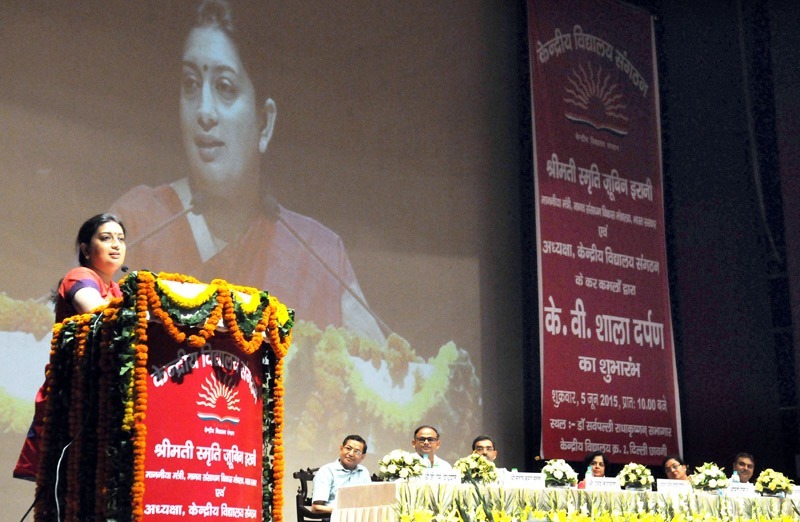 Smriti Irani while launching KV Shaala Darpan programme of Kendriya Vidyalaya Sangathan in New Delhi today said that the programme will write a new definition of e-governance, good governance, and digital India. Elaborating upon the details the Minister said that this programme will be a step forward in the direction of fulfilling the vision of digital India of our Prime Minister Shri Narendra Modi. She further said that with the launch of KV Shaala Darpan, parents will get entire information at a unified platform about their children in respect of the attendance status, performance, health challenges and entire academic record from Ist to XIIth standard. Students will have facilities of e-tutorials and learning aids to enrich their knowledge. She made an appeal to the parents not to put unnecessary pressure on the children while availing the facility of getting instant information under this system. The Meeting of the Consultative Committee of Parliament for the Ministry of Human Resource Development was held here today. The subject of discussion for the meeting was “National Education Policy”. The Union HRD Minister Smt Smriti Irani while introducing the topic of discussion welcomed the members attending the Parliamentary Consultative Committee Meeting. Minister of State for HRD, Shri Upendra Kushwaha also attended the Committee Meeting. A presentation was made at the Consultative Committee Meeting by the JS, Ministry of HRD which highlighted the need for formulating the New Education Policy. The presentation brought out the fact that since technology has evolved and MOOCs, Distance Learning and on line courses are the emerging areas today in the educational scenario, there is a greater need to work out a New Educational Policy. The New Education Policy aims at meeting the twenty- first century challenges – globalization and liberalization. Also changing nature of knowledge and multi-disciplinary approach to learning, calls for formulating a New Education Policy according to the Presentation.